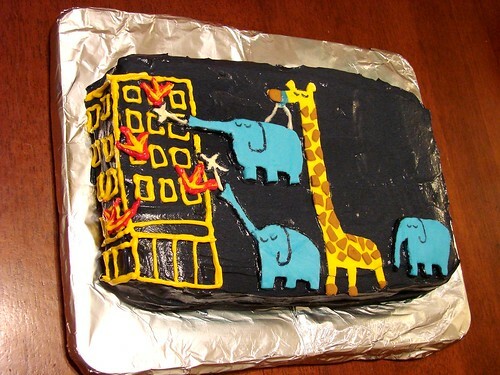 With hundreds of excellent designs it was tough to pick my muse, but something about the giraffe and elephant fire brigade just spoke to me. Those the critters looked so serene in the face of an enormous inferno--I love it. I wish this shirt came in my size (hint, hint--I hope this one reprints!). 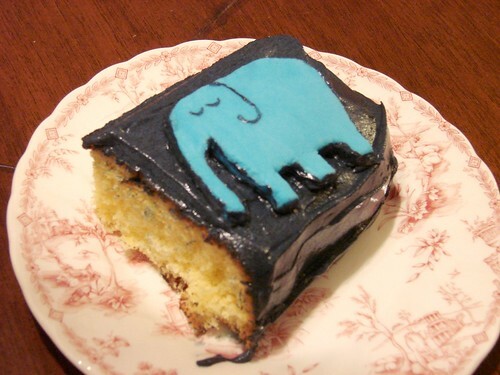 The rules specify that the cake has to be edible with limited structural assistance. 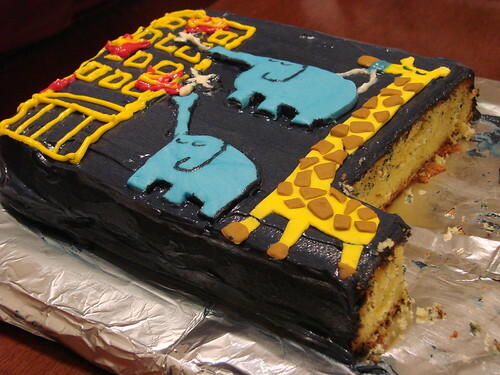 Considering the laws of physics and gravity and what it would take for a completely edible spindley necked giraffe to house a wide and dense elephant, I decided that this particular design would be best served by a 2 dimensional cake. I wanted to use my frosting painting techniques to create the dark blue background and bring the building and flames to life and though I've never worked with fondant before it seemed like the best medium for getting really fun and vibrant animals. I must admit that after scanning my cookbook collection on a sweltering summer day, I gave up on creating a cake from scratch and put my fate in the hands of Duncan Hines. While the cake was baking a went to work softening the butter for my frosting and working the food coloring into my ready rolled white fondant. 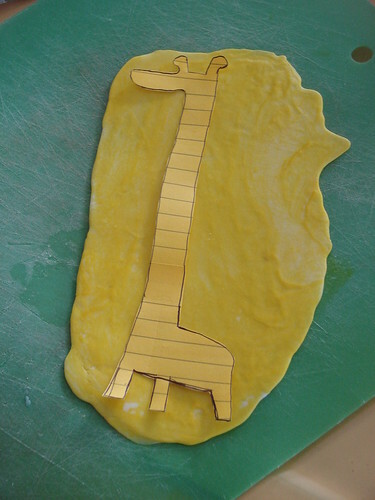 When the fondant was the right color I sketched out the elephants and giraffe forms onto paper that I could use as forms for cutting out the rolled fondant. 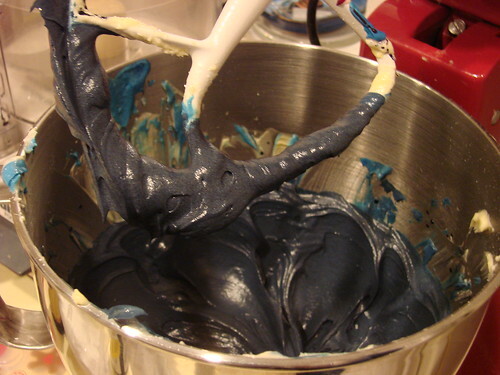 I created the dark blue frosting with a standard buttercream recipe. Because the cake was so large I used 3 sticks of butter and a couple cups of confectioners sugar plus vanilla and liberal amounts of royal blue food coloring with touches of black and red food coloring. 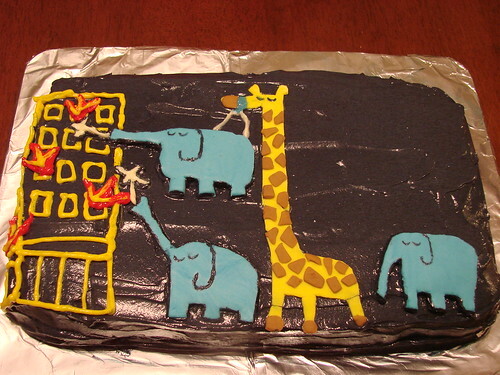 Once the cake was ready to frost I applied the base coat of dark blue and then laid the animal characters in position then piped the outline of the building on the cake's surface using the side of the cake as the side of the building to give the design depth. Then I piped on the flames and water spray and added the elephant harness. After I took the photos we immediately dug into the cake. Delicious. Totally worth the frightening blue teeth and tongue. There are some AMAZING entries in both the 2D and 3D categories. Check out the Threadcakes gallery for pics of all of the cakes. For some reason flickr is freaking out with these pictures and they are showing up intermittently. Check out Threadcakes to see my official entry. I think you made a wonderful cake. It's very true to their designs. looks amazing! nice work, you are a war machine.